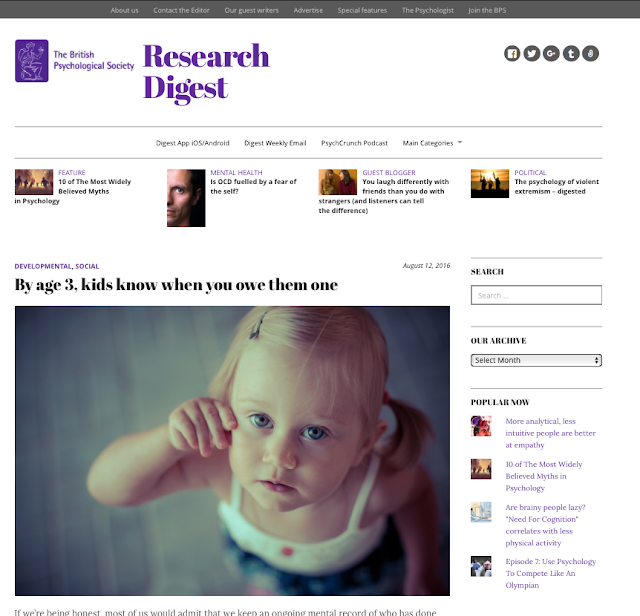 BPS Research Digest: What do young children know about managing fear? What do young children know about managing fear? The recent film adaptation of Maurice Sendak's Where the Wild Things are prompted much debate about whether it's appropriate to subject children to material which they could find frightening. It's rather topical then that a new research paper has looked at young children's understanding of fear reduction strategies, finding them to be more precocious than previously realised. Liat Sayfan and Kirsten Lagattuta presented 48 children aged between 4 and 7 years with picture-based short stories. The children were asked to imagine that they were the central character. The stories involved the child, either alone or with a companion, catching sight of a possible threat - either what could be a dangerous creature, such as a bear, or what might be an imaginary frightening creature, such as a ghost. The pictures were drawn such that the presence or not of the threats was ambiguous. Even the youngest children recognised that people differ in how vulnerable they are to fear, seeing adults as being less prone than children and men less prone than women. The girls were more sensitive to these differences than the boys. Another gender difference was that, at all ages, the girls tended to propose more avoidant fear reduction strategies - such as running and hiding - compared with the boys' suggestion of more aggressive strategies, including going on the attack. Surprisingly perhaps, children at all ages suggested that the story characters could use psychological (e.g. 'imagine that my mummy is there') as well as behavioural (e.g. 'go to my room') strategies to overcome their fears, although this tendency did increase with age. Another developmental change was that the older children proposed more 'reality affirming strategies' (e.g. 'I can remember that ghosts aren't real') whereas the four- and five-year-olds proposed more so-called 'positive pretense' strategies (e.g. 'I'll use a sword to fight the dragon'). 'These data advance current knowledge about the development of children's understanding of mind, emotion, and coping during childhood,' the researchers said.